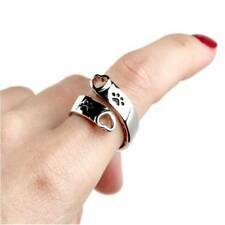 Jewelry Hand Stamped Ring Dog Paw Print Hollow Heart "i Will Love You Forever"
Fashion Lettering Ring. Best Gift for Pets' Masters. 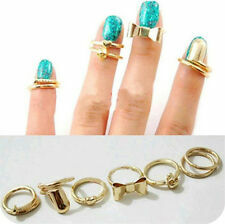 Material: Alloy. 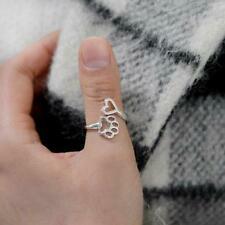 925 STERLING SILVER PLATED HEARTS ADJUSTABLE RINGS RING FINGER/THUMB RING. SIZE: Adjustable. Colour: SILVER. DELAYED/UNRECEIVED ORDER. Great for anyone who plays poker, or indeed Miss Harley Quinn = Suicide squad. Goes up to ring size Q. Fashion Heart Crystal Braided Beading Rope Bracelet Bangle Adjustable Jewellery. Hot Stainless Steel Gold Set Horse cat Animal Necklace Earrings Jewelry Wedding. Silver Korean KPOP Bangtan Boys BTS JIMIN Stainless Steel Stud Earrings Jewelry. 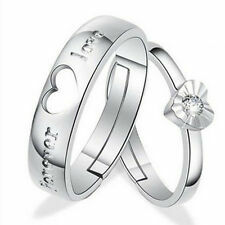 A lovely couples silver plated love you forever diamante adjustable open rings. An elegant alloy heart shape band ring. Alloy with silver finish. Approx 18mm (approx size Q). Alloy with rose gold finish. A simple and trendy heart ring, wear it to create a stunning and fashionable look. Approx 17mm (Approx size N).